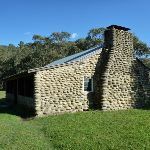 Starting from the northern end of Geehi Flats Camping area, this walk first visits the Geehi Hut before crossing Swampy Plains Creek and walking along a 4WD trail, part of the Bicentennial National Trail to Keebles Hut. 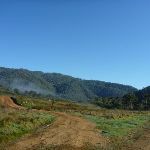 Here the walk loops back via another 4WD trail following the creek most of the way back to the start. 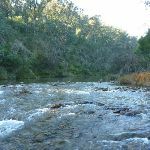 The alternate entry described in these notes follows another 4WD trail in and uses a bridge to cross the creek, helpful if you want to keep your feet dry or when the creek’s flow is too great to cross safely. 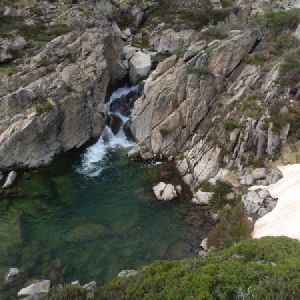 This walk leads through an alpine environment and all walkers must be well prepared. During summer, be prepared for both hot and cold weather, high winds, rain, extreme UV levels and some sections of snow or ice on the ground. 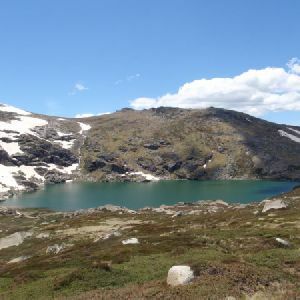 Before starting this walk, check advice with Snowy Region Visitor Information Centre (02) 6450 5600, the weather forecast and the snow conditions then change your plans as needed. These notes, grades and walking times have been written for use in the summer months only. 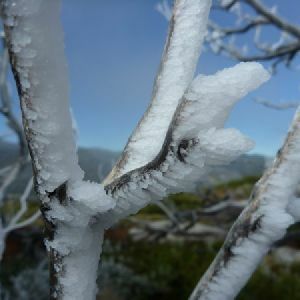 Between May and the end of October, there is a much higher change of snow, ice and extremely cold conditions. 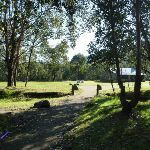 This is a very large campsite with plenty of space for roaming about and with some interesting things to explore. 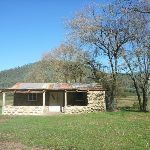 The campsite sits on the bank of the Swampy Plain River, which offers some opportunities for fishing. There are plenty of toilets scattered around (with access for people in wheelchairs). 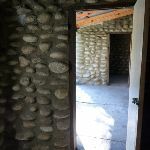 There are several stone shelters, historic huts, and walking tracks in the area. 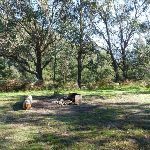 The individual campsites are not marked out, but there are plenty of spots to choose. 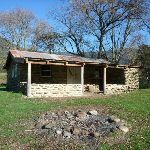 There is no charge for camping (although vehicle entry fees apply). From the car park, this walk heads north away from the face of ‘The Western Fall’ sign along the paved path. 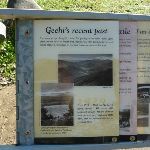 The path soon turns away from the road and crosses a small ditch to find a book-like ‘Geehi’s recent past’ information sign. Here the walk heads across the grass to Geehi Hut a short distance away. 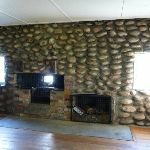 Geehi Hut, also known as Airstrip or Nankervis Hut, was originally built in 1952 by Jim Nankervis and his brother, to assist with grazing. 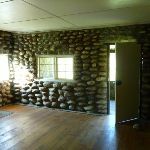 The 11m x 9m river stone building has three rooms, including a fireplace (not for use). Near the hut is a wheelchair-accessible toilet and plenty of space for camping. 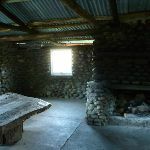 The hut was restored in 2004 by the NPWS. 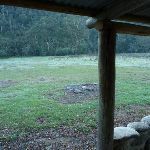 The remains of the older Tyrrell’s Hut can be seen nearby. More info. 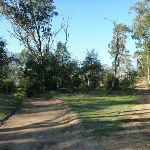 Turn right: From the car park, this walk heads west along the dirt road away from the toilet whilst initially keeping the hut a short distance to your right. 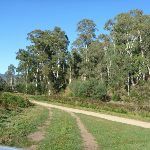 The trail soon leads past a locked gate (on your right) and the down to a few campsites just before Swampy Plain River crossing and a ‘To Behrs Flat – 4 Wheel Drive’ sign. Continue straight: From the intersection, this walk crosses the rocky ford Swamp Plain River crossing. 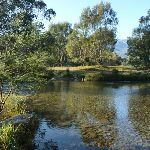 This river is impassable after rain or snow melt, take care not to cross when the river is too high or too fast. 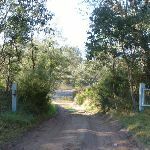 Once on the other bank, this walk heads through the gate (locked to vehicles in wet conditions) and comes to a clear, three-way intersection with another 4WD trail (on your left). 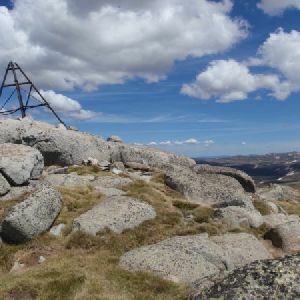 Turn left: From the entrance to Geehi Rest Area, this walk follows the ‘Jindabyne’ sign along the Alpine Way. 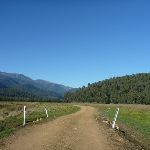 The road soon leads across a bridge, over Swampy Plains River and comes to an intersection with a 4WD trail (on your right), just on the other side of the bridge. 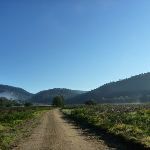 Turn right: From the western side of Geehi Bridge, this walk follows the 4WD trail off the main road, down the short hill and along the side of Swampy Plain River (keeping the river to your right). The walk soon passes a short side trail (on your right, that leads down to the river), continuing instead parallel to the river along the clear trail through the trees. 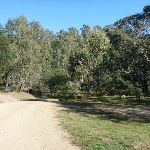 The trail soon passes a ‘To Behrs Flat – 4 wheel drive – Dry weather only’ sign and continues through the forest for about 400m to a large turning circle (on your right), just before a gate (locked to vehicles in wet conditions). From this turning area, this walk continues along the trail steeply uphill, through the gate. 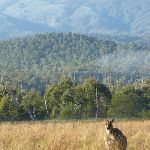 As the trail reaches the high point, there are good views down to Swampy Plain River and across Geehi Flats. 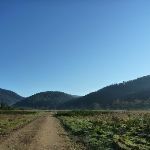 The trail then leads down the hill to a three-way intersection with the Bicentennial National Trail at Behrs Flat (to your left) and a gate and creek crossing (to your right). Now Veer left to rejoin the main walk . Veer right: From the intersection, this walk follows the flat trail north-west into Behrs Flat clearing (directly away from Swampy Plain River). 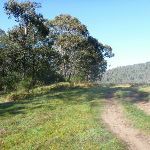 After a short distance, the trail comes to a ‘Y’ intersection with a grassy trail (on your right), just before a couple of trees standing by themselves. Continue straight: From the intersection, this walk heads north further into Behrs Flat clearing, initially keeping the grassy trail to your right. The clear trail soon passes two shrubby trees then continues to wind through the open, grassy clearing. 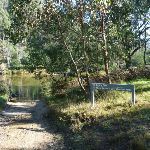 The trail crosses a small, culverted creek, then about 150m later, comes to a ‘Y’ intersection (with a trail leading steeply up to the left). Continue straight: From the intersection, this walk heads north towards the hut along the wide trail. 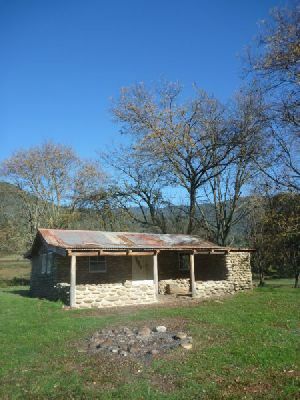 The trail soon bends right and leads past the ‘Keeble’s Hut’ information sign, coming to a large, open area in front of the hut. 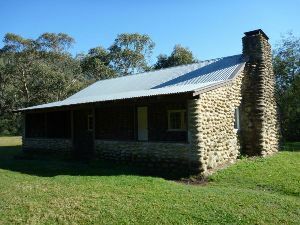 Keebles Hut was built in 1948 as a fishing lodge by Arthur Keeble, for Arthur and Flo Nankervis. 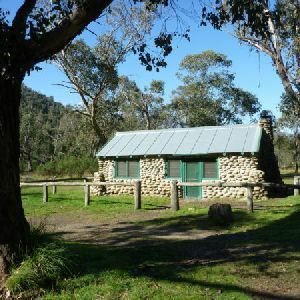 The hut has been under the management of NPWS since 1970, with upkeep maintained by family members. 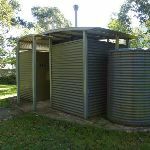 A renovation was organised in 2002, by Kosciusko Huts Association and the Range Rover Club of NSW. 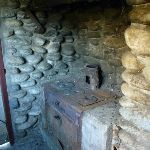 The hut offers a fireplace and a wood-powered stove, as well as a large indoor table. 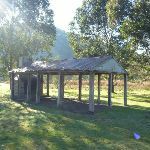 Around the hut is a popular camping area, with picnic tables, a toilet and a river nearby. More info. 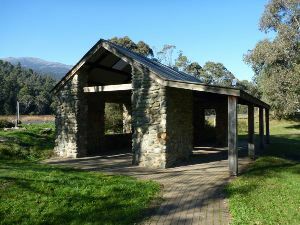 Continue straight: From the hut, this walk heads north-east across the grassy flat, away from the front of the hut and towards the creek, following the faint grassy trail. 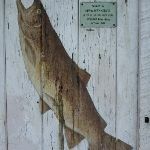 The trail soon becomes clearer and then bends right to head upstream, keeping the river through the trees to your left. 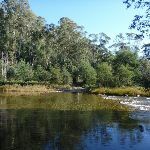 The trail leads along the edge of the clearing, past a few river-side campsites and about 800m from the hut, the trail bends right at a larger campsite beside the river. The trail leads through the clearing and soon comes to a clear three-way intersection with the Bicentennial National Trail. Veer left: From the intersection, this walk heads south-east along the clear trail, keeping the tall stand of trees to your right. The trail soon leads to a ‘Y’ intersection just before a (usually unlocked) gate (and creek crossing on the left branch). Veer left: From the intersection, this walk heads south, downhill through the gate (locked to vehicles in wet conditions) to the edge of the Swampy Plain River. This walk crosses the rocky ford Swamp Plain River crossing. 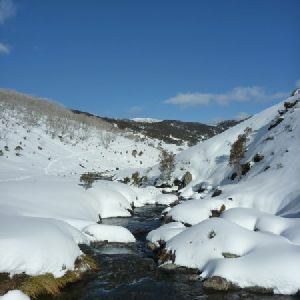 This river is impassable after rain or snow melt, take care not to cross when the river is too high or too fast. On the other side, the trail leaves the water and comes to the edge of Geehi campground. Continue straight: From the south side of this Swampy Plain River crossing, this walk follows the dirt road uphill as it bends left. 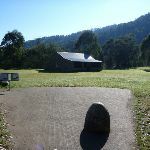 The walk follows the main trail as it leads past a few campsites and a locked gate (on your left), coming to a turning area, car park and toilet marked with a ‘the Western Fall’ information sign (with Geehi Hut a short distance to the left). 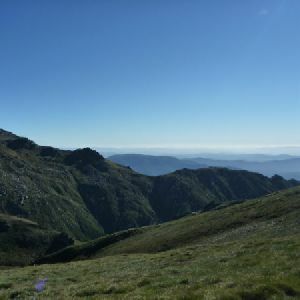 Around 2.4km of this walk follows a clear and well formed track or trail, whilst the remaining 210m follows a rough track, where fallen trees and other obstacles are likely. 1.3km of this walk has directional signs at most intersection and another 1km has minimal directional signs. The remaining (320m) is clearly signposted. 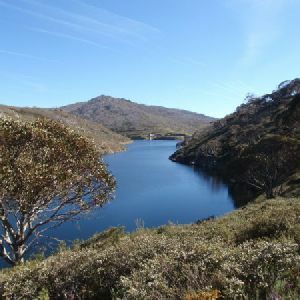 2.1km of this walk requires some bushwalking experience and another 320m requires no previous bushwalking experience. 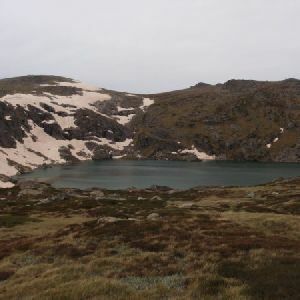 The remaining (210m) requires a leader a with moderate level of bushwalking experience. 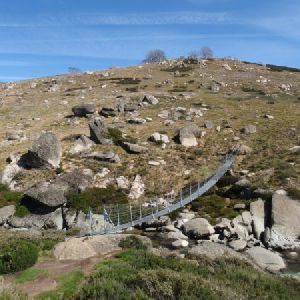 2.3km of this walk is affected by storms that may impact your navigation and safety and another 210m is affected by forecast, unforecast storms and severe weather events that may impact on navigation and safety. The remaining (170m) is not usually affected by severe weather events (that would unexpectedly impact safety and navigation). 2.1km of this walk has limited facilities (such as not all cliffs fenced) and another 320m is close to useful facilities (such as fenced cliffs and seats). 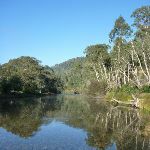 The remaining (210m) has limited facilities (such as cliffs not fenced, significant creeks not bridged). 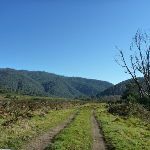 A list of walks that share part of the track with the Keebles Loop walk. 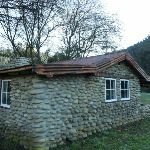 This walk takes you on a tour of some of the historic huts north of Geehi Flats. 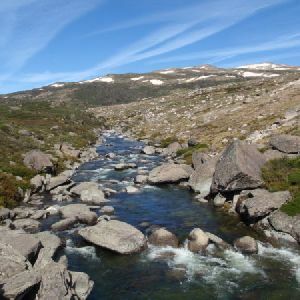 Starting from the northern end of Geehi Flats Camping area near Geehi Hut, you will cross Swampy Plains River and walk across the plain to an intersection just before Keebles Hut. 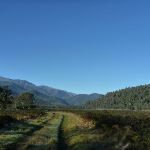 Here the walk heads up on the higher section of Behrs Flat and then down and across Swampy Plains River again. 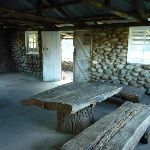 You will then follow another trail to the old Geehi Hut, once used as a youth hostel. 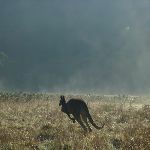 A list of walks that start near the Keebles Loop walk. 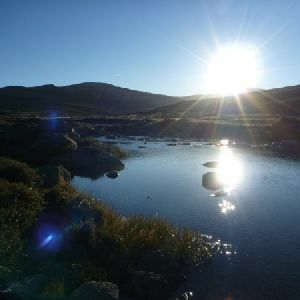 http://new.wildwalks.com/wildwalks_custom/includes/walk_fire_danger.php?walkid=nsw-kosciunp-kl Each park may have its own fire ban, this rating is only valid for today and is based on information from the RFS Please check the RFS Website for more information. 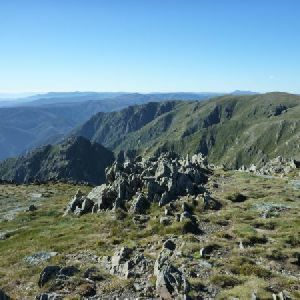 This walk starts in the South West Slopes weather district always check the formal BOM forecast or pdf before starting your walk.